Emerging Markets & International Business - follow SECSTATE? While democrats congregated in Charlotte this week there was a notable absence. Prohibited by the Hatch Act of 1939 from attending, but more importantly, preoccupied with a US foreign policy pivot, Hillary Clinton has spent the week in Asia. SecState Clinton's travels took her throughout the APAC region - but there was a singular focus to all her efforts. The geopolitical wrestling match over the South China Sea region, and the tug-of-war over the ASEAN nations. As the US was preoccupied with wars and focused on other regions, China has aggressively moved to claim rights & resources and to forge alliances with the nations in this global pivot region. 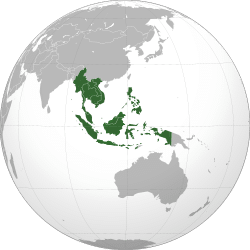 Alarmed by this trend, and India's intended influence from a third axis, the US government has made Southeast Asia an area of intense focus. International business development is about two goals. Expanding markets to increase revenue and profits, and diversification to guard against cycles in any one region - particularly a near complete domestic focus. Therefore it's important when targeting markets to pick those where barriers are manageable (tariffs, corruption, infrastructure) and where favorable trends (demographics, GDP, consumer income, geopolitics) will provide the rising tide to help lift one's export boat. But with so much chatter about BRICs, emerging markets, CIVETS and Next-11, the man who coined the original term suggests just referring to growth markets. The point is that you need to find the right markets for your business (product, objectives, experience.) And the first thing many companies do is to chase the headlines and race to the BRICs. But that's rarely the best approach! What does it mean for you & your international business? Normally high level strategy provides material for the wire but doesn't directly and immediately impact most companies business development strategy. But this time is different. The US is strategically motivated to craft a strong pan-ASEAN foundation based on military collaboration and massive trade facilitation. If they want you to sell there and succeed, why would you decline to leverage all the resources they will provide? The demographics are generally favorable and the growth forecasts are compelling. Don't reflexively chase the BRICs. Don't blithely pursue "emerging markets" because that sounds good. And don't chase markets where the long-term trends don't mesh with your strategy. Want to explore what markets make sense for your international business development effort? Contact Consilium Global Business Advisors. And in the meantime learn more about the compelling African & ASEAN opportunities for American companies.